Advocates of abortion often argue that what's at stake in an abortion is a blob of tissue. 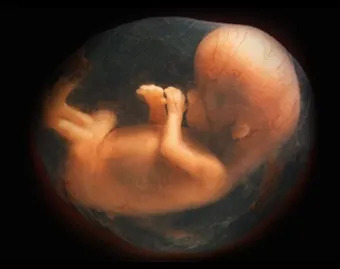 But real-time ultrasounds have shown us the humanity of the child in the womb. We can now see preborn babies turning somersaults, sucking their thumbs, and sticking out their tongues--actions that would be impossible for a mere blob of tissue. Your preborn child started the same way that you did--through the fertilization of your mother's egg by your father's sperm. Your preborn baby has its own set of genetic characteristics, and may even have a different blood type than you do. Your baby's heart is distinct from yours and beats with its own distinct rhythm. Your baby has organs which are separate from yours. These facts demonstrate that a preborn child is not simply part of a woman's body, but a distinct individual who should have rights of his or her own. 1.1 million U.S. abortions each year. 50% of women now seeking abortion have had at least one previous abortion. 51% of abortions are performed on women less than 25 years of age. Abortion disproportionately affects black and Hispanic women. for those suffering in the aftermath of abortion. spiritual direction, and referrals to mental health professionals. "I didn't think anyone would understand how I felt. with someone who understood what I was going through. No one condemned me. They understood and helped me forgive myself."